Spaghetti Squash Alfredo is a low-carb, gluten-free way to satisfy your cravings. 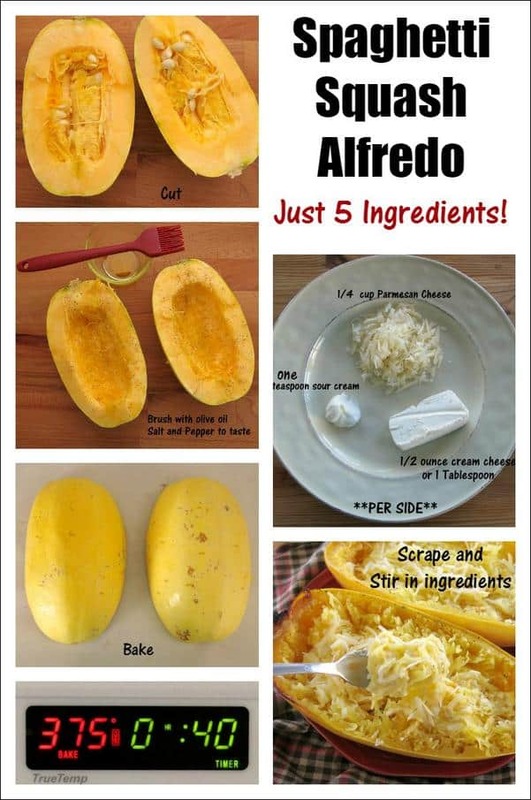 Mix the alfredo sauce ingredients right into the cooked squash and eat right out of the boat! Are you limiting carbs? Counting calories or points? Did you make health-related resolutions this year that you’re bound and determined to achieve? If so, you need this skinny version of Spaghetti Squash Alfredo in your recipe box! It’s much lower in calories and carbs than regular pasta alfredo. However, watch the portion size if you are on a keto diet. Come fall/winter, this recipe takes over where Easy Zucchini Noodle Alfredo leaves off. In fact, the ingredients are almost identical except that you don’t have to spiralize anything! I’m partial to super simple low-carb recipes that incorporate vegetables in my quest for being healthy! I promise to share all the tasty recipes and any tips I learn along the way…because that’s what I do. 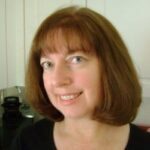 🙂 You’ll find many of the recipes in the Low Carb Options/South Beach Phase 1 Category of the Recipe Archives. There are just a few ingredients, it takes minutes to prepare (once you cook the spaghetti squash) and there are minimal dishes to wash. I like to cook spaghetti squash in the oven. It’s all hands off time and it seems to deepen the flavor more than the microwave method. Under either method, I suggest poking holes all over the squash with a knife (to allow steam to escape) and microwaving for 1 minute to make it easier to cut the spaghetti squash in half. This is a chore I do not like. But, it is always worth the effort. Using the baking method, cut the spaghetti squash in half, scoop out the seeds, brush the inside with olive oil, sprinkle with salt and pepper and bake the sides face down on baking sheet lined with parchment paper for about 40 minutes in a 375 degree F oven. When time is of the essence, and you need to curb your spaghetti squash alfredo craving stat, try the microwave method. I follow this method over at The Kitchn for Cooking Spaghetti Squash in the Microwave Oven. The beauty of this recipe is that the ingredients are added directly to the cooked squash. The squash is so hot the ingredients melt as they are gently mixed into the strands of flesh. Enjoy it straight from the squash or scoop it onto a plate. Either way, this creamy spaghetti squash alfredo will satisfy a craving for decadence. It’s not pasta. But, it sure is delicious! Please rate this rate and tag @DinnerMom and #DinnerMom on social media. We love to see what you are cooking up! Spaghetti Squash Alfredo is a low-carb way to satisfy your comfort cravings. Mix the alfredo ingredients right into the cooked squash and eat it out of the boat! Poke each spaghetti squash with a knife on all sides (about 10 times or so) to allow steam to escape while cooking. In order to make it easier to cut the spaghetti squash in half, place squash on a microwave-safe plate and cook in the microwave for 1 minute. Cut each squash in half and scoop out the seeds. Brush the inside with olive oil and season with salt and pepper. Place squash halves on a sheet pan lined with parchment paper. Place each squash half on a serving plate. The squash will be very hot. Using a fork, scrape the strands of flesh away from the skin. Add 1 Tablespoon cream cheese, 1 teaspoon of sour cream and 1/4 cup of Parmesan cheese to the center of each squash half. Gently stir the ingredients into the strands of flesh until they until melted and the strands are coated. Enjoy straight from squash or scoop onto a plate. 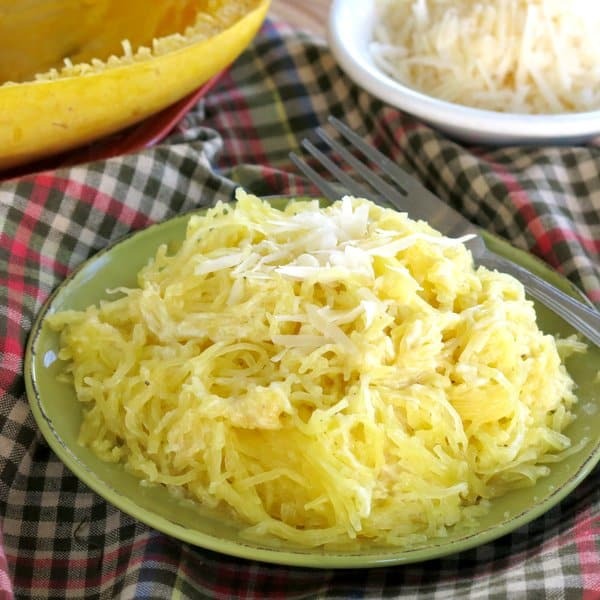 If following a keto diet, then limit the serving size to 1/4 of a medium spaghetti squash and cut the nutritional estimate in half. Use low-fat cheese and sour cream to cut back on calories and keep the recipe South Beach 1 compliant. This looks so good! Can’t wait to try it for dinner soon! I love spaghetti squash and i LOVE that you made alfredo! YUM! I’ve cooked spaghetti squash many different ways. Oven, microwave, crock-pot , and grill. What I haven’t done is add cream cheese, sour cram and Parmesan cheese to it! YUM!! Fabulous recipe, I dig a good squash recipe and this one fits the bill. I could inhale this in 2 seconds flat. 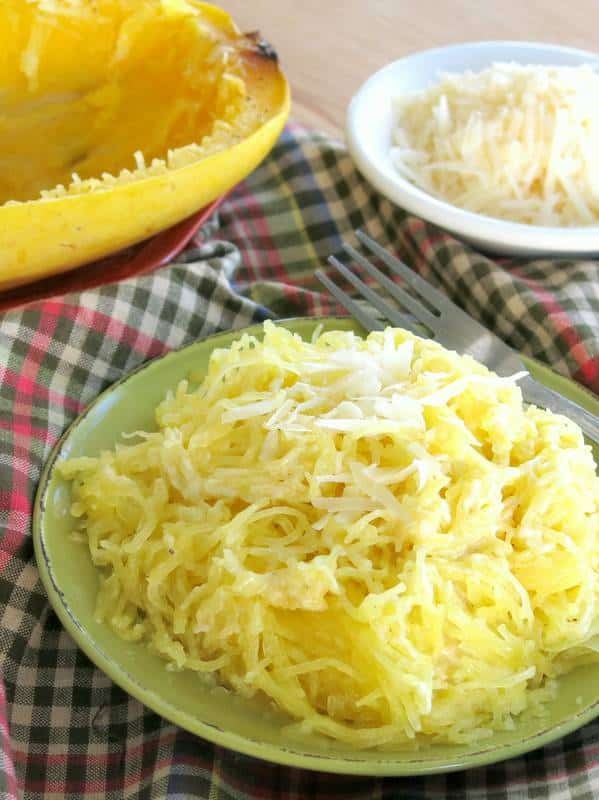 You just reminded me that I haven’t made spaghetti squash in ages PLUS I have never tried it it Alfredo style – what a great idea! Only five ingredients?! This is a total winner!! 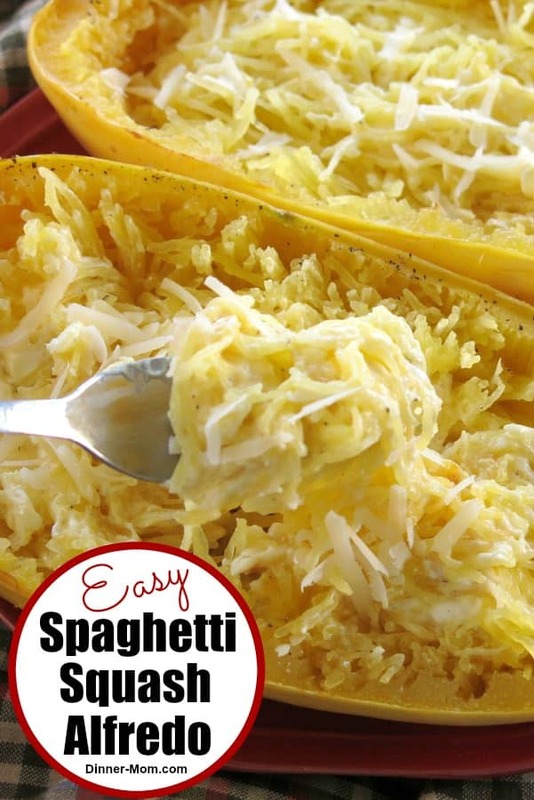 I have to try spaghetti squash one of these days…It’s just never been in front of me lol! As far as goals, go for it! I am off to a sluggish start to 2016 with an impromptu destination spa vacation kicking off the year and prolonging my holiday fever. Finally, I am buckling down this week and off & running! I made these today parents loved them need had spaghetti squash before now I’m in love. Will be one of my good to meals. I had a spaghetti squash sitting around so I decided to try it. So yummy, my daughter loved it too. Was eager to try this recipe, but found it to be a little too bland. Hello! If you make it again, try adding a little garlic powder or red pepper flakes.